Automobile concern HINO at the moment is one of the largest automobile factories in Japan for the production of trucks of medium and large tonnazhnosti. 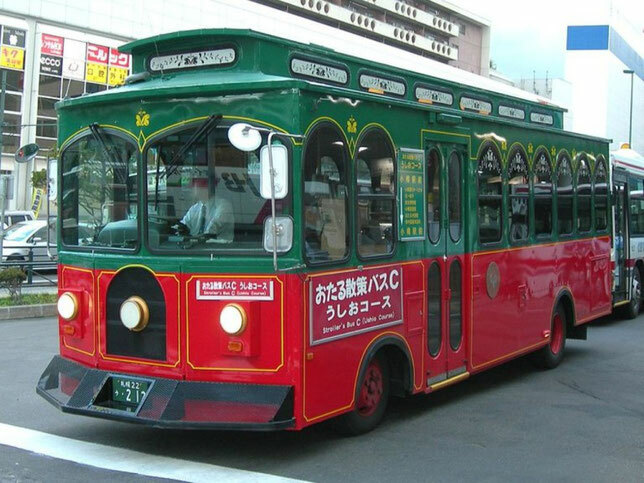 The thread of the history of the automobile plant stretches from the first manufacturers of trucks - Japan: the Tokyo Shipyard "Tokyo Ishikawajima Shipbuilding - Engineering Co" and the Tokyo Gas and Electric Company - "Tokyo Gas Electric Industry Co". 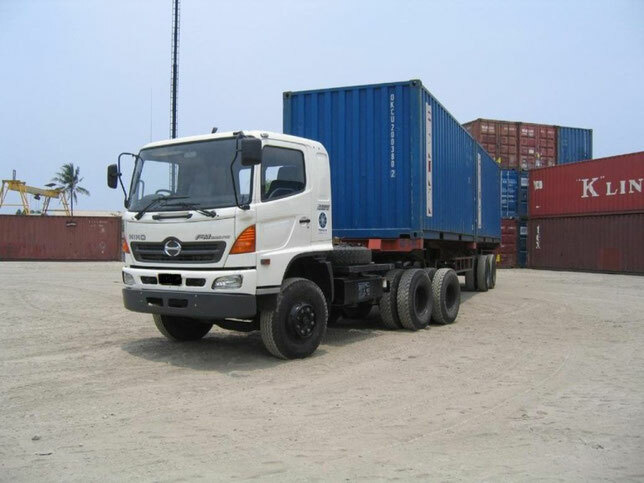 These firms produced almost identical trucks bearing the "Sumida" and "Chiyoda" brands. And in 1937 when the enterprises united themselves, the produced trucks were given a different name, "Isuzu" (look: ISUZU truck PDF Manuals). But in 1941, after another regrouping of its forces, the company again changed its name to "Diesel Motor Industry Co." A little later in 1942, a reconstruction took place in which the company, which belonged to the company TGE, separated and at the same time took the name "Hino Heavy Industry Co". In the separated company continued work on the production of 7-ton trucks with 6-cylinder diesel engines with air cooling capacity of 125 hp. In 1946, at the automobile plant "HINO", they developed and built their first diesel-powered tractors with a load capacity of 15 tons and a pneumatic brake drive. In 1948, the company, renamed "Hino Diesel Industry Co", chose as its main direction the creation of a wide range of diesel engines for heavy trucks. 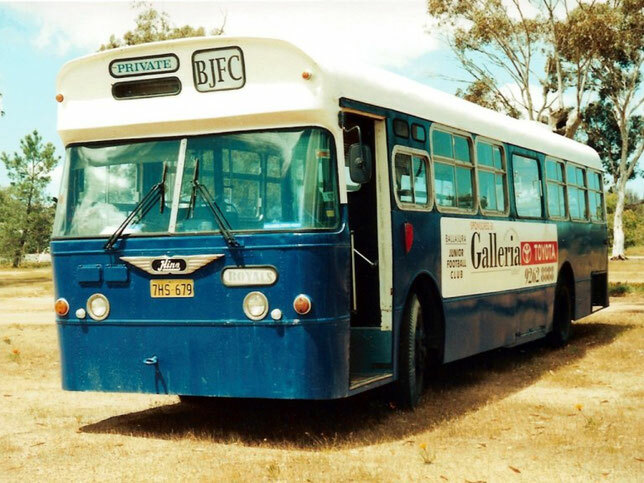 Only in 1953 began assembling a 13.5-tonne dump truck "ZG" with a 1-seater cabin, a 6-cylinder diesel engine in 175 hp. And 6-speed gearbox. Only by the end of the 50's there were basic 2 and 3 axle hood cars "HINO" with a carrying capacity of 4-10 tons ("TE", "TN", "ZC"). They were equipped with unified 6-cylinder engines (7014 and 7690 cm3, 125-150 hp), 4-speed gearbox, dual main gears, spring suspension and pneumatic brake drive. 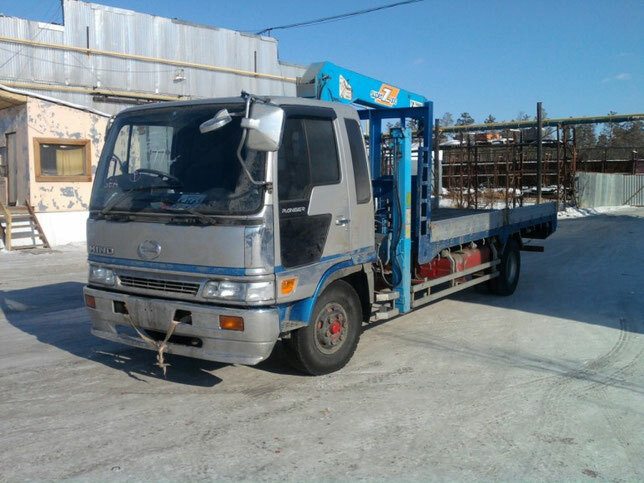 In the early 60's, the automobile company Hino Motors Ltd laid the foundation of its truck program. Since 1961, the first 35-strong Brisca pickup truck with a load capacity of 750 kg was offered on the chassis of the Contessa passenger car. A year later, there appeared 3-wheel trucks "Orient" and "Hustler" with a capacity of 12 horsepower with all-metal cabs and bodywork. Interest in such cars was soon lost and the company started creating new larger trucks. In the 60-ies. The launch of a family of middle class "Ranger" with a cabin above the engine, which included 2-axle 90-strong models "KL", "KM" (4 × 2) and "WB" (4 × 4) with a carrying capacity of 3-4.5 Tons, 7,5-ton "KS", heavy hood 14 ton dump trucks "ZM" (6 × 4) with a 10-liter diesel engine with a power of 190 horsepower, beskapotnye 200-strong trucks "TS" (6 × 2) with two front driven bridges. A feature of heavy vehicles was a 4-step demultiplikator, increasing the total number of transmission transmissions to 16 - 20. In March 1967, the company "HINO" became a part of the automobile company "Toyota", turning into its subsidiary for the production of medium and heavy trucks. In the seventies, "HINO" was engaged in improving its program and introducing a new range of diesel engines with direct fuel injection. In 1980-81, a new range of middle-class Ranger cars was introduced with a gross weight of up to 16.5 tons with an improved cabin above the engine. A year later appeared a heavy scale "Super Dolphin". Machines equipped with new more economical motors, had the name "Econo Diesel". 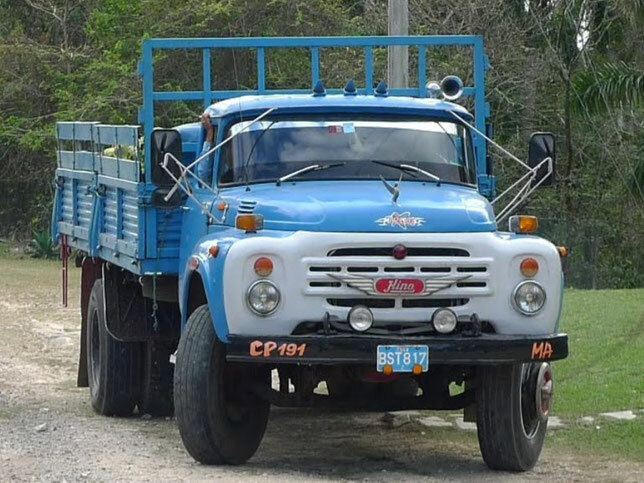 The first series included numerous models FB, FC, FD, FE, FF, FG, FT (4 × 2) and all-wheel drive models "FB", "FC", " GD "and" GT "(4 × 4) with a total weight of 7.5-16.5 tons. They were equipped with economical 4-and 6-cylinder diesel engines (3660-7412 cm3, 113-195 hp) with a new system of HMMS mixture formation. They used a spiral pipe to supply air to the cylinders and three hemispherical grooves in the head of each piston, which contributed to the appearance of microscopic vortices. This created better mixing of air with fuel, improved temperature conditions, ensured more complete combustion, reduced fuel consumption and toxicity. Simultaneously, their simplified hood analogs "NH", "KY" (4 × 2) and "NZ" (4 × 4) were produced. The heavy gamut included the new boneless models "FR" (6 × 2) and "FS" (6 × 4) with a total weight of 23-26 tons, as well as traditional "ZM", "ZY" (6 × 4), "ZC "(6 × 6) and 16-ton log carriers" WG "(6 × 6) with a total weight of up to 35 tons. They were equipped with naturally aspirated inline 6-cylinder diesel engines or V8 and V10 engines (9419-24610 cm3, 215-520 hp). 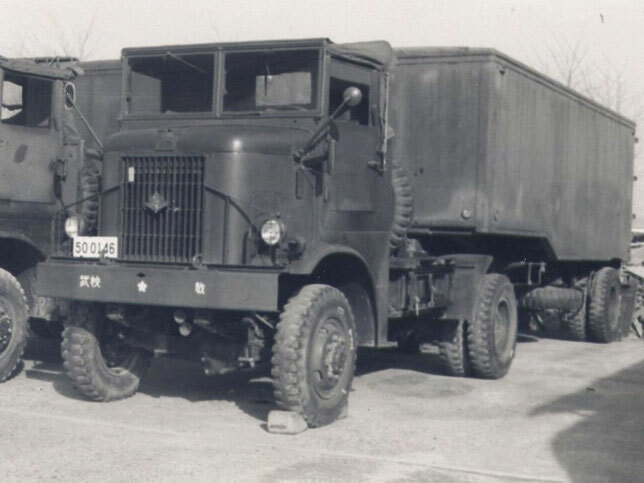 The company also offered trunk tractors with a cab above the engine models "SH" (4 × 2) and "SS" (6 × 4) for road trains with a gross mass of 38-55 tons, capable of speeds of 90-112 km / h.
They were equipped with the most powerful engine options, 9-speed gearboxes and the HIMR energy recovery system (an electric motor built into the flywheel, which acted as a starter, generator and retarder brake). At that time, "HINO" had a broad program, consisting of 20 basic models, each of which hid a dozen options. On models for Japan since 1981 the first in practice "HINO" diesel with a turbo-supercharging and intermediate cooling, automatic transmissions, a pneumatic suspension bracket and forward disk brakes was established. In 1982, the company celebrated the production of a 1 millionth car. By the end of the decade, having produced 27942 trucks with a gross tonnage of more than 15 tons, HINO came in seventh in the world. 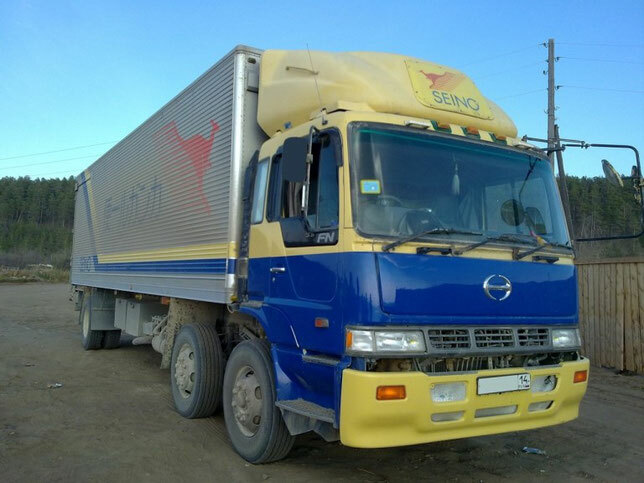 In the nineties, trucks HINO received more modern comfortable, safe and streamlined cabins and lightweight low-frame chassis, which allowed the maximum use of the permitted length of a single car in the country of 12 meters. The new series of the middle class began to be called "Space Ranger". It included 14 basic models, including on-board FC, FD, FE, GD, FJ (4 × 2), FT, FX, GX (4 × 4 ) "FG" and "GK" (6 × 4) with a carrying capacity of 4-11.5 tons and a total weight of 8.5-17.8 tons. They were equipped with 4 and 6-cylinder diesel engines without a charge (4899 - 7961 cm3, 140-235 hp) and one version of an 8-liter engine with a turbocharger and intermediate cooling with a power of 260 horsepower, 5 or 6- Th stepped gearboxes. A number of models were offered with pneumatic suspension and disc brakes with ABS. 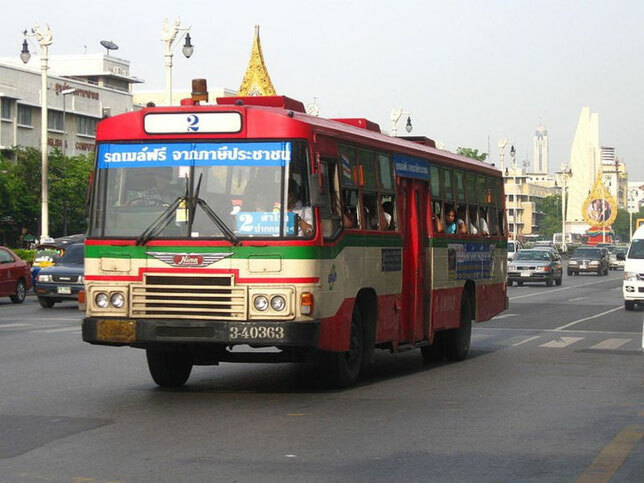 In 1999, the new lightweight model "FB" was replaced by a new delivery range "Dutro" with a payload capacity of 2-4 tons, developed jointly with the firms "Toyota" and "Daihatsu". Cars with a total mass of 4.5-7.5 tons were equipped with diesel engines with a capacity of 130-150 horsepower and a manual transmission. In 1992, the formation of the most complete heavy low-frame series "Super Dolphin Profia" began. The basic steels were trucks and vans FH (4 × 2), FN, FP, FR, GN (6 × 2), FS and FQ (6 × 4) FW "(8 × 4) with a lifting capacity of 8.9-16.2 tons and at the same time with a gross mass of 15.7-25.9 tons with engines with a capacity of 300-520 horsepower and a body capacity of up to 66 cubic meters. The main novelties were variants of "Prophia" and "Profia Teravi" (Teravie) with less toxic motors with variable geometry of the inlet branch pipe of the turbocharger, a mechanical 7-step or automatic 16-speed gearbox, the predominant use of a pneumatic suspension with electronic chassis level control, With short cabins with a berth over the driver's seat. In 1999, a 13.7-ton truck, the Profia Teravi FN, appeared with a long base, with its middle steering bridge moved to the middle of the cargo platform. The series "Super-Dolphin" also included mainline tractors "SH" and "SS", as well as a 30-ton dump truck "WR". The cars of this range are used as previous aspirated diesel engines (13267-25977 cm3, 270-480 hp), and new 6-cylinder 24-valve engines with high-pressure injection and turbocharged with intercooling (10520-12882 cm3, 330 -400 hp), working with mechanical boxes with the number of gears 5-8. Some models are equipped with environmentally friendly engines that run on compressed natural gas, ABS, electronic brake-force regulation on wheels, electromagnetic retarder brakes, air suspension of cabins and a radar safety device. In 1996, the company "HINO" released its 2 millionth car. In Japan, it owns 8 plants with a staff of about 10 thousand people, including the largest robotic complex in Hamur near Tokyo, where all units and parts for cars are manufactured. In addition, the company has several assembly plants in the US, Ireland, Thailand, Egypt, Malaysia, the Philippines. By the end of the twentieth century, all of them produced annually 80-90 thousand trucks and buses, including machines with a gross mass of more than 6 tons, about 33 thousand pieces. In terms of production, the company ranks 16th in the world and the third in Japan. HINO trucks are delivered to more than 100 countries. But not so long ago the concern decided to try its truck on Dakar.